A classroom full of 6th grade students in Chicago play the opening chords to Joan Jett’s “I Love Rock and Roll” and 800 miles away in lower Manhattan, another group of kids joins them for a jam session via video-conference. Both classes were just outfitted with brand new Epiphone Les Paul electric guitars, compliments of the Les Paul Foundation. “This is the best class of the day,” says Alejandro, a student at Lower Manhattan Community Middle School, referring to the Little Kids Rock class in which he and his classmates learn to play guitar, bass, drums, keyboards and sing songs that they know and love. “Jamming with kids all the way in Chicago… that’s a first me.” It was a milestone for Little Kids Rock as well. The epic jam session was inspired by a grant from the Les Paul Foundation, who is supporting Little Kids Rock’s efforts to bring music education to thousands of additional students like Alejandro and develop special new curricula focused on many of Les Paul’s achievements. 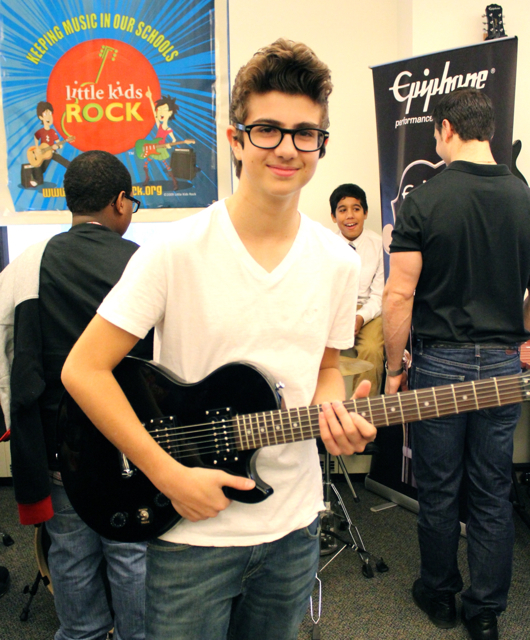 Little Kids Rock student Alejandro with a brand new Epiphone Les Paul electric guitar. Les Paul was an American jazz, country and blues guitarist, songwriter, luthier and inventor. He was one of the pioneers of rock and roll and is credited with inventing the solid body electric guitar, and popularizing recording innovations including overdubbing (also known as sound on sound). He was also a member of Little Kids Rock’s honorary board of directors, and his legacy of impacting music for the next generation lives on through the foundation’s support. Les Paul Foundation Executive Director Michael Braunstein and Longtime drummer for Billy Joel, Liberty DeVitto with a gift from students. The foundation’s Executive Director Michael Braunstein visited Lower Manhattan Community Middle School- MS896, a Little Kids Rock school in New York City, on Wednesday, December 11th surprising the students with a delivery of Epiphone Les Paul electric guitars. Simultaneously, supporters of Little Kids Rock’s Chicago chapter delivered Epiphone Les Paul electric guitars to Edwards Elementary in Chicago and the young rockers jammed via Skype from nearly 800 miles away! 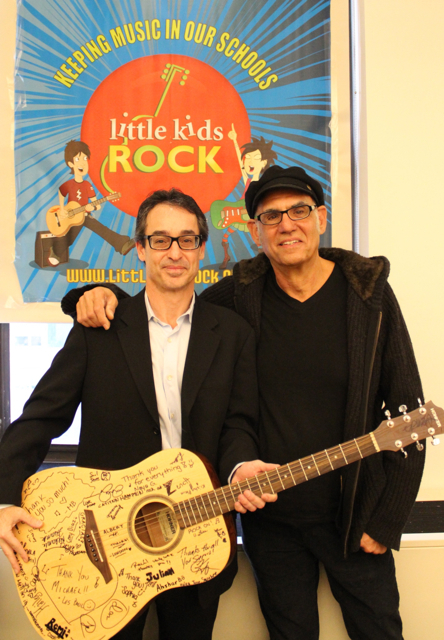 Longtime drummer for Billy Joel and Little Kid Rock honorary board member Liberty DeVitto joined the group in New York City and gave students a master class on drumming. Hi there, You’ve done a fantastic job. I will certainly digg it aand in my view suggest to my friends.